If you have been a teacher for some time now, there are probably certain principles you strongly believe in. It is possible that you consider some approaches better than others. For example, you might believe that communicative language teaching is better than the grammar translation method. Or, and this is my case, you may believe that certain seating arrangements work better for your classes than other alternatives. I've always felt a strong dislike of teaching language classes in the traditional classroom layout - straight rows facing the front of the classroom. Ironically, although this straight row arrangement has been widely criticized, mostly because it is said to inhibit experimentation in the classroom, it still predominates in most educational settings. It is not surprising that the majority of classrooms in the school where I work are arranged this way. I've always preferred the horseshoe arrangement, mainly because I believe that it's best for both student-student and student-teacher interaction. I like it when I can face all my students and I like the space this type of layout provides. But more importantly, I think it's good when students can see one another's faces (and mouths) all the time. This is particularly important in a language classroom, where people listen and talk to each other most of the time. In fact, whenever I had to teach in a room where this arrangement wasn't possible, I felt extremely uncomfortable. But some time ago I became a student again and I started attending seminars and workshops, where both types of layouts were common. Suddenly, seen from the student perspective, the one I disliked as a teacher didn't seem much worse than the one I preferred. On the contrary, I remember occasions when I felt physical and psychological discomfort when sitting in the horseshoe arrangement; either because I had chosen an inconvenient spot - one of those places where I was forced to keep my head and neck in a very unhealthy position when looking at the board - or because the room was jam-packed with people and I felt I had lost my personal space - the intimate zone reserved for close friends and family members. Back to my teaching context, though. 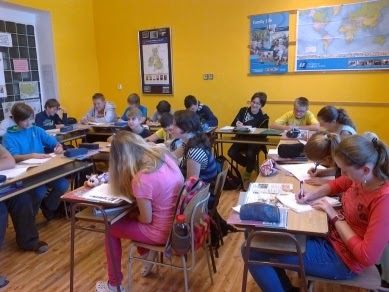 I teach in a small room which can accommodate up to 22 people. The size of the room allows you to make a horseshoe out of 8 double desks at the most. 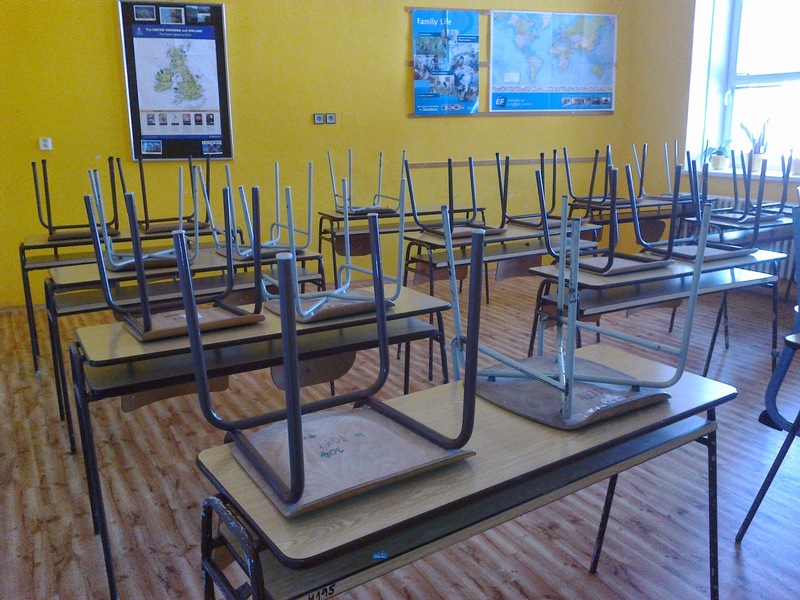 However, as I started teaching slightly larger classes back in September, and I didn't really want to move into a different room, I simply brought three more desks and created an additional, smaller horseshoe inside the big one. As you can see below, although it looked pretty cosy and learner-friendly, it was crammed with quite a few students. This realization, as well as my personal experience, nudged me into a small experiment. One day, before the first group entered the room, I had changed the current layout to the traditional one (see below). As it is quite a small room, the change didn't look too dramatic to me, but I felt that at least I had created some space around each desk. Nevertheless, it was interesting to observe my students' first reactions to the tweak. I had to smile when I overheard some of the comments the kids uttered upon entering the classroom: "What? " Oh no! " What's this supposed to be? " "Oh dear!" "This is terrible!" Some just looked puzzled thinking that this was only a mistake which was going to be fixed as soon as their lesson started. The whole point of the post will be revealed soon. I obviously might have changed the layout right after having heard the initial negative reactions, but I decided to wait for a couple of more lessons and enjoy all the psychological impact this alternation had on my students. I want to stress that all my students are in their teens, which means that their negative reactions may only be a type of adolescent rebellion. Anyway, after the second lesson spent in the 'new' room, when they seemed to have adjusted to the change a bit, I asked each group the following question: I know you said you felt discomfort when you entered the room for the first time, but I'd like to ask you to share with me some potential advantages this seating arrangement might bring. I was really surprised at some of their ideas. Although some students still kept the defensive pose, others had already changed their mind. Well, actually, it's not that bad. I'm enjoying it after all. Here are some of the perks they eventually came up with. The tongue-in-the-cheek ones are indicated with a smiley face. 1) I can hear my partner better during the speaking activities, probably due to the fact that our personal space is not invaded from all directions. 2) I don't have to look at other people's faces :-) My personal note: I believe that some students might also find it embarrassing to be constantly observed by their peers. 4) My neck doesn't hurt anymore. 7) We can concentrate better. The most obvious conclusion is that most people resist change and they don't hesitate to express the resistance as soon as they are confronted with something new. But once they adjust to the new thing, they may discover that it's not that bad in the end. It's possible that sooner or later they will want to come back to the old and traditional, or maybe they'll want to move one step forward. I myself made a step forward when I tried something I had always been reluctant to do. I should add that from a technical point of view, there are some advantages to this seating arrangement, such as the fact that the students can easily and smoothly change partners without even having to stand up. But this is for another post.